Elope wedding packages for just the 2 of you are easy and stress free at the all inclusive resorts listed below. 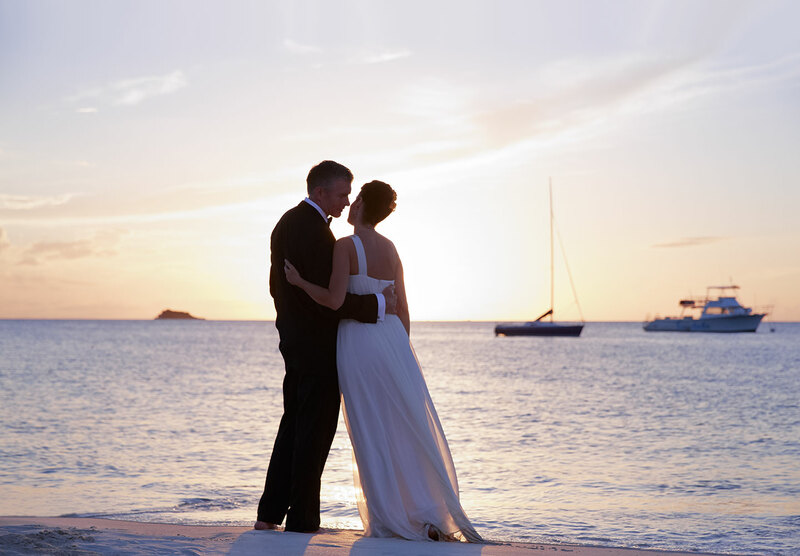 Caribbean destination wedding packages are a breeze. Let's start you off with 2 of our favorite resort companies. Couples Resorts and Sandals Resorts are known for 2 very distinct features. Both have amazing all inclusive programs and both are couples only. These 2 features make them stress free and romantic. The 4 couples resorts in Jamaica are hard to beat for eloping. With just a 3 night stay they throw in the one love wedding package for free or you can upgrade to the runaway bride package and get some nice extras. Sandals Resorts with 15 locations on 7 different islands open up your options even more with very similar packages. All 7 locations are English speaking and weddings can be arranged easily and for FREE with just a 3 night stay. You will have to pay some legal government fees, which vary from island to island, $95 to $325. 2 very popular Elope wedding package destinations are Punta Cana and the Cancun/Riviera Maya area. We save those for last because they are more difficult to do a legal wedding. If you don't mind doing just the symbolic ceremony, Secrets Resorts and Excellence Resorts offer exceptional elope packages. If you are going for less than 7 nights, you'll have to pay for a basic wedding package of $850 to $999. If you book a higher room category for 7 nights, the resorts will throw in the wedding package for free. Does Mexico or Punta Cana have free all inclusive weddings with a shorter stay than 7 nights? Yes, absolutely at the Hard Rock Hotels in Cancun, Riviera Maya and Punta Cana, you can get a free symbolic ceremony with just a 3 night stay. Most of our wedding packages we arrange are for just 2. So, let's go.